This past Friday evening we received the worst weather that we’ll get all winter… 30 degrees with a bit of rain that changed between rain, snow, and sleet. I figured it was my duty, as a 4×4 owner, to go out in the weather and scope things out. After about 30 minutes of warming up the truck and scraping nearly half an inch of ice off the windshield I finally made it out of the driveway. The roads well traveled seemed to be ice-free, but those seldom driven were a disaster. The latter were the ones I chose to drive, intentionally. Surprisingly, there weren’t any wrecks on the road that I saw. However, there were the usual idiots that think it’s alright to pull out in front of me with only 100 yards to spare, as well as the drivers that feel the need to drive 10mph over the speed limit, despite the conditions. While driving around, I remembered a building that had caught my eye in the past. I figured this was a great opportunity to drive by and find out what it was. 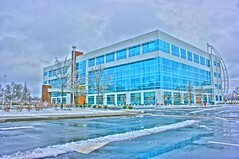 The building (pictured above) was one of the newer offices for the Greenville Hospital System. The windows were what caught my eye before and they proved to be very photogenic (especially after a little doctoring). The parking lot is like a maze to navigate and was covered in ice. At one point in time I found my back tires traveling faster than the fronts and moving in a completely different direction. No harm done. I even tried to complete the maneuver a 2nd time but was unsuccessful (being that I couldn’t get the rear to slide, not wreck). This entry was posted on Sunday, January 31st, 2010 at 12:37 pm	and is filed under Photography. You can follow any responses to this entry through the RSS 2.0 feed. You can leave a response, or trackback from your own site.